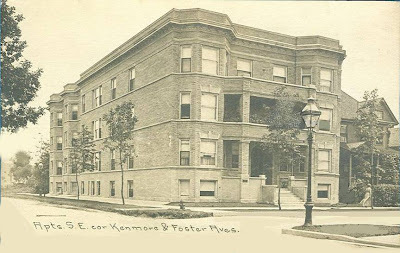 Southeast corner of Kenmore and Foster, circa 1910 (above) and as seen on Google Street Views (below). As I look at the building it seems to me thst one of my friends lived in the 3rd floor, north side. Their aparment was absolutely humungous! My family owned and lived in a two-flat on Dover, but it was nothing like that apartment for size. I'm confused. In the late 30's my grandad was the janitor of the building on the southeast corner of Kenmore and Foster. I lived at 5100 N. Sheridan Rd. i.e. the northwest corner of Sheridan and Winona. One of my main occupations was roller skating around the block bordered by Sheridan, Winona, Kenmore, Foster. My problem is that I don't remember that building looking like the picture. I remember a lobby entrance at street level with a marquee in front. Is my memory totally gone? Can anyone help me out? Also, does anyone have a picture of 5100 N. Sheridan before it was torn down in 1974? I grew up in Uptown 1950 to 1980 on the west side of the street on Kenmore and at Winona . Right next to this building was a 4 story Hotel ( one rooms weekly rent ) building with a marquee and an Awning that went to the curb and then Straight across the street from our Building ( 5104 ) was another Hotel that was a 4 story building , white in color with the entrance Lobby door ground level and a Marquee with the name which I can not remember right now that was over an awning that went from the door to the curb. There was a big fire there back around 1966 or 67. This may be the building you are thinking of if you rollor skated around the block from 5100 N.Sheridan rd. Back in 1950's to 1970 was a nice and safe area to live. I do remember that hotel on Winona and Kenmore. I think I'm a bit mixed up about the building on Foster and Kenmore. Oh well, it has been more than 70 years.